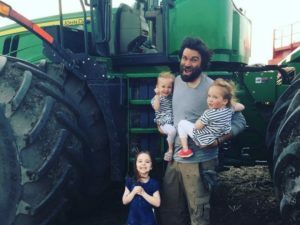 Travis Heide was raised on a conventional farm and used to take it personally when his wife, who grew up on an organic farm on Vancouver Island, talked about going pesticide and fertilizer-free. Now, the Saskatchewan-based farmer owns one of the biggest organic farms in Canada. Heide has since gone all-in on organic and is pushing to see how big such farms can grow with a 16,200-hectare operation, as the industry matures and concerns mount about the impacts of conventional farming. The federal government, for example, recently moved to phase out nicotine-based pesticides that are linked to a rising number of honey bee deaths. Heide said a childhood of using the best and newest pesticide sprayers and tractors on his father’s farm, plus time working in the commodities trading business, has helped set him up to think big on the organic side. His push for scale mirrors what looks to be a wider trend in the organic space of larger farms and the potential efficiencies that come with size. A report from the Canada Organic Trade Association released this year showed the total organic prairie acreage totalled 663,700 hectares in 2016 to finally top the previous peak of 574,700 in 2009 when the financial crisis led to a plunge in organic crop prices and acres. Meanwhile, the 1,442 organic producers on the prairies is still off the peak of 1,610 active in 2009. “It may be an indication that we’re looking at fewer farmers, larger acres,” said Marla Carlson, executive director at SaskOrganics. The shift comes as farmers gain access to better techniques and technology as they look to close the productivity gap compared with conventional farming that’s been a hurdle for farmers and a major source of criticism for the sector. “There’s lot’s of reason to hope. We’re seeing very large increases in productivity from the good farmers,” said Laura Telford, organic sector development specialist at Manitoba Agriculture. Farmers now use camera-guided machinery and mechanical weed cutters imported from Europe that look like hundreds of scissors snipping thick weed stocks. Tighter, more precise crop planting also leaves less room for weeds to grow. For fertilizer, farmers are relying on old techniques of crop rotations and growing specific crops to increase soil fertility in what’s known as green manure. Farmers are also getting better at intercropping; growing chickpeas, lentils and other pulses that trap critical nitrogen in the soil without needing to buy it from agricultural conglomerates. “They’re kind of magic crops that work with soil microorganisms to actually make that atmospheric nitrogen available to the plant itself,” said Telford. Heide said he has some crops coming in only 20 per cent less yield than conventional farms, though Telford said it’s common to see organic yields at 50 per cent less. Organic farmers also avoid dealing with the increasingly concentrated agricultural industry, including Bayer’s blockbuster takeover of Monsanto and PotashCorp’s merger with Agrium to form Nutrien Ltd., and instead spend locally, said Heide. Now that Heide has made the shift he’s become something of a champion for the style, but also feels the pushback from the conservative farming community. He’s been confronted at a funeral about the drawbacks of organic and gets sneers from truckers coming to pick up the crops. “We started the organic experiment, and it changed the way we were viewed,” said Heide. A recent report from Canadian Organic Growers said stigma was one of the risks of switching to organic farming, though the paperwork, weed management, and understanding inputs are seen as higher risks. Discussions around organic farming can still be very polarizing, but attitudes are changing, said Carlson at SaskOrganics.